Following the success of its Model T, Ford expanded its operations to many countries, in which American models from the Dearborn maker were at first made without modifications, before specific cars, better suited to local markets, entered production. In Europe, apart from the still-existing branches in England and Germany, Ford set up a factory in France. At first, it was nothing but a small assembly line set in the seaport of Bordeaux. The unit built cars sent from Detroit in CKD, before undertaking the whole building process. The crude Model T never sold well in France, unlike most other countries, but later, V8-powered cars received a much better welcome from the French public. By the mid-Thirties, Ford's French branch, by then known as Ford S.A.F., enjoyed a decent share of the domestic market, but lacked proper industrial capacities in order to expand. In the meantime, the Mathis empire, once a commanding entity on the French industrial scene, was threatening to tumble down. The company had heavily invested in state-of-the-art facilities in Strasbourg, near the German border, which due to the bad fortune of its owner remained largely underused. The solution was therefore an obvious one: a marriage of reason between the two companies, which started to build in Strasbourg some large V8 sedans directly adapted from American models. These cars, sold as Matford, didn't last. Commercial failure had nothing to do with it, as the cars were well appreciated, but war had broken out between France and Germany. In 1940, the Alsace region, to which Strasbourg belongs, was annexed by the victorious Reich. This success was not to last, as everybody knows. By 1946 guns were silent again and automobile production was about to resume... but Ford and Mathis had already agreed upon an amicable divorce. Ford had acted ahead, and built a new factory in Poissy, near Paris. Keeping in production the dated Thirties models was out of the question. What to offer to the public then? Ford S.A.F. 's president, Maurice Dreyfuss, made several trips back and forth across the Atlantic in order to plead for his company, though no one in Detroit was much interested in the French branch's future. Nonetheless Dreyfuss insisted and, one day, stumbled upon what he was eagerly looking for. Fearing a postwar recession, most American automobile giants had had blueprints drawn for downsized models, able to content an impoverished public. Prosperity came instead, postponing the release of the first compact cars by fifteen years, and that of the first downsized full-size sedans by three decades. All these wartime plans went to the garbage can, where Dreyfuss picked his car. The Detroit management finally gave the go-ahead for the production on French soil of their aborted project. Though small by American standards, the Vedette, as Ford S.A.F. named it, still appeared large through the eyes of an European motorist. Its 2.2-liter V8 offered sluggish performances and quaffed gasoline - still rare in war-torn Europe - but its buyers enjoyed the typical soft ride of larger American cars, a spacious passenger compartment and the pride of owning a much desirable vehicle. 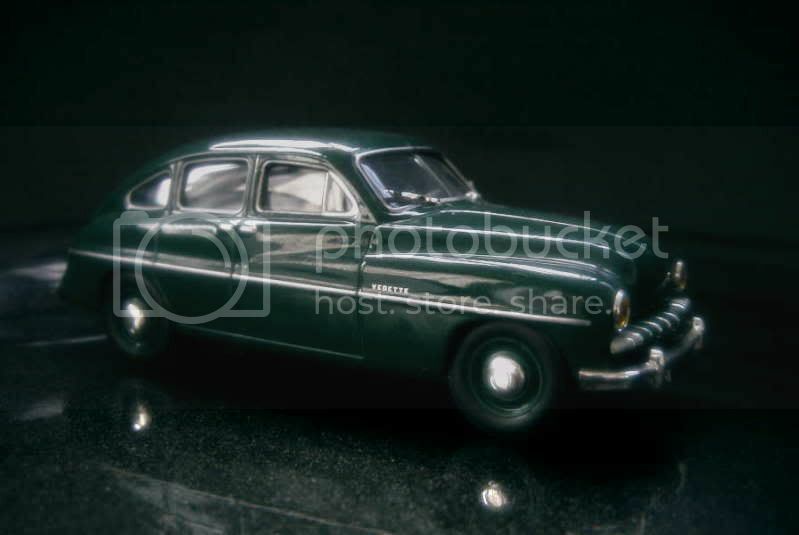 The Vedette was introduced at the 1948 Paris autoshow as a 1949 model. The new Vedette sold correctly but real success was hampered by a variety of problems. Concerns arose about the poor quality of the cars, Ford having subcontracted the production of many of its parts to smaller companies which, in the hard times of the era, often delivered sub-par elements. Poor performances, as noted above, were another source of grievance from disgruntled drivers. In addition to this, the design of the car was rapidly ageing: a rounded fastback sedan still looked fresh in 1948, but was definitely dated four years later. Ford addressed the complaints by gradually improving the quality of its production, and by fitting a larger engine under the bonnet of its car. The 2.2-liter engine, soon slightly enlarged, remained standard with the Vedette, but a new top-of-the-line Vendôme appeared. Apart from more luxurious appointments, the Vendôme benefited from a 3.9-liter V8, a descendant of prewar engines used in American Fords, and directly lifted from a truck then built by Ford S.A.F. With nearly twice the displacement, the larger engine offered a lot of torque, but only marginally more power. Furthermore, it gulped gasoline much faster than its already-thirsty smaller counterpart, had a tendency to easily overheat (writing most of this by memory, I could be wrong on this one), while its modest origins repelled many a potential customer. 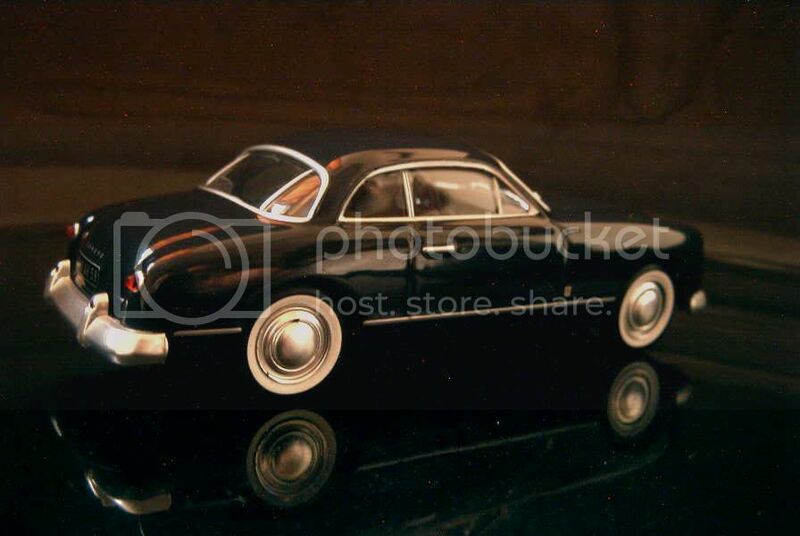 The company also submitted its car to a major update for 1953. Not much could be done about the rear suicide doors, by then an anachronism, but the rounded look was broken by new longer, taller rear fenders and an elongated boot. A new grille was also fitted at the front. All this, in the mind of Ford S.A.F. 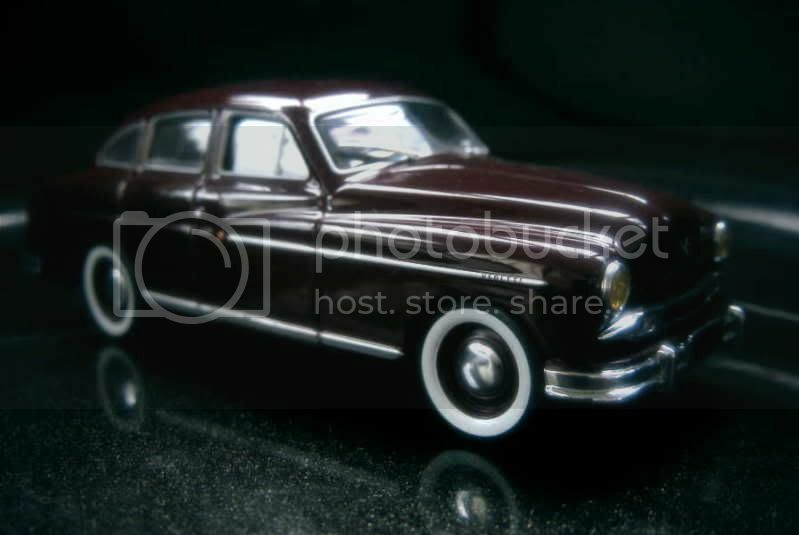 's directors, would be enough to wait until a second-generation Vedette, scheduled for the end of 1954, could be released. The Vedette is better known as a four-door sedan, but actually appeared under a variety of guises. A convertible sedan with fixed window frames, a convertible coupe and a coupe were also offered, as was a bare Abeille, with minimal equipment and a two-part gate at the back, aimed mostly at shopkeepers. Apart from these pure Vedette derivatives, an elegant coupe, the Comète, was also put on sale. Designed and constructed by the coachbuilder Facel, which would soon launch its very own automobile, the Comète suffered even more than the Vedette from its lack of performances. Accordingly it too received the 3.9-liter V8, cars thus equipped becoming the Monte-Carlo. 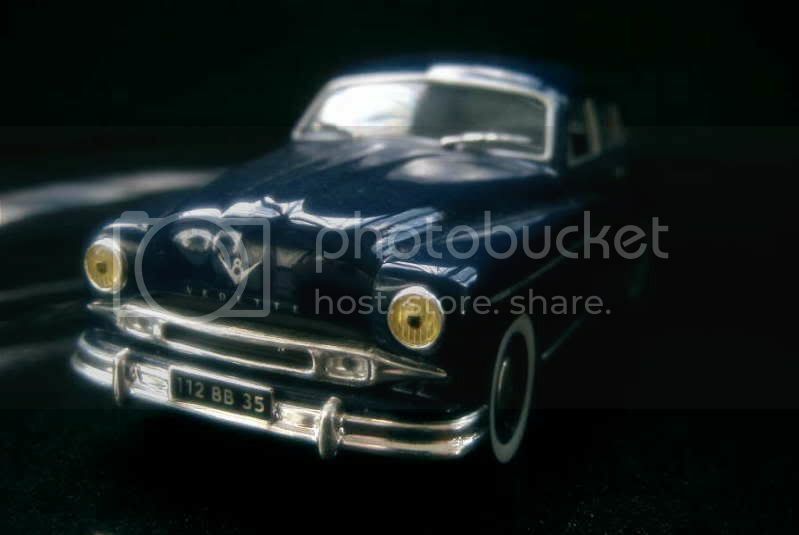 I've always been fond of this car, and clearly remember why: when I was around 7 or 8, I saw Jules Dassin's movie Du Rififi chez les Hommes (simply called Rififi in its English version), a French film noir classic, in which a Ford Vedette is prominently featured. 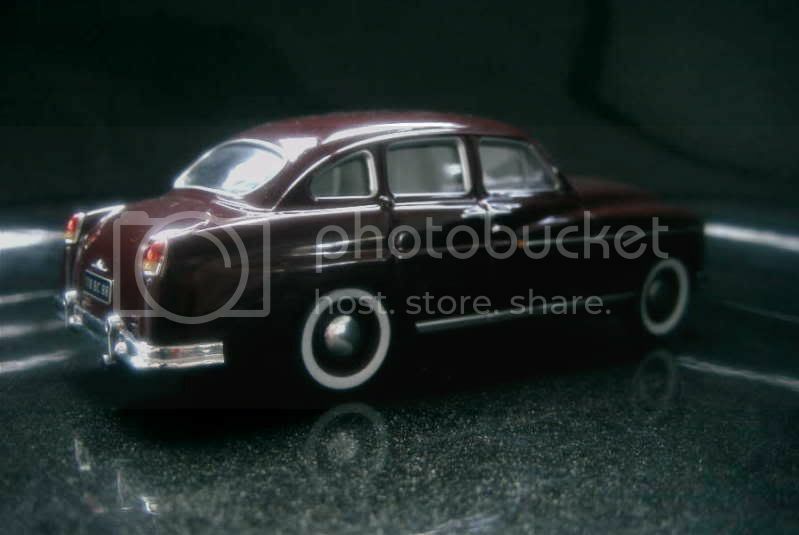 A nice model of this car. Being a press release, the price is quite affordable, too. I'd rate it at 13/20. Another Ixo press release, this time reproducing the updated Vedette as it looked near the end of its career, with its longer - and heavier-looking - rear. The quality of reproduction being somewhat equal to the previous model, I'd therefore give it 13/20. The car itself is much more original than the better known original fastback model. 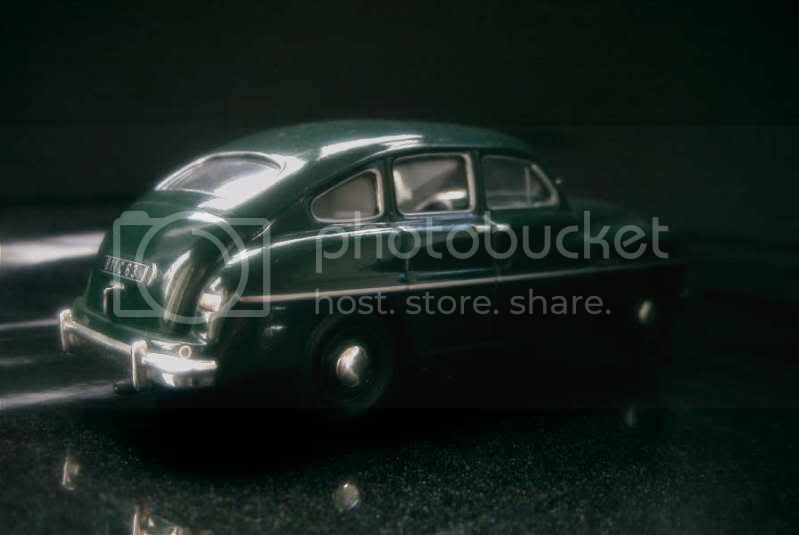 The main reason I had for buying this model was to compare an original Ixo with an Altaya-distributed one. Though some of the later models are more or less simplified, this one appears perfectly identical - apart from its paint, as everyone would have noticed from the pictures -, hence a rating of 13/20. Unless you cannot find any of the Altaya version, or you don't like its colour, avoid purchasing the much pricier Ixo. 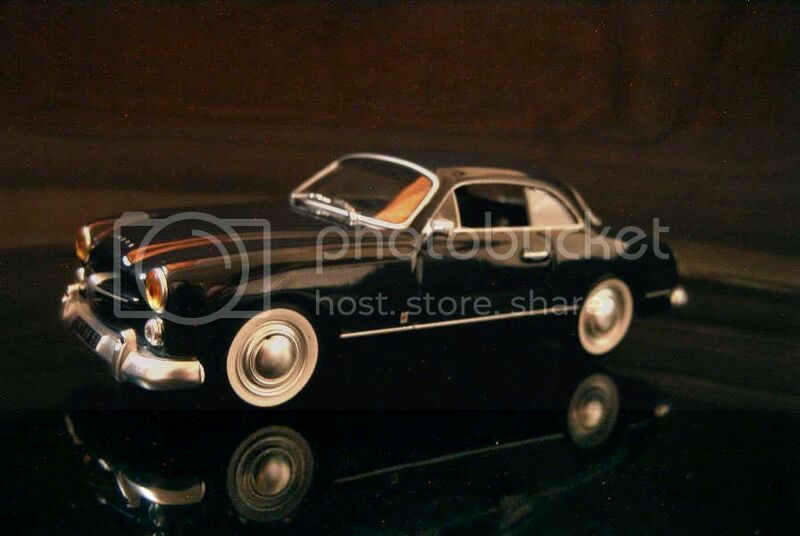 A beautiful model, which perfectly reflects how fine the original car was. 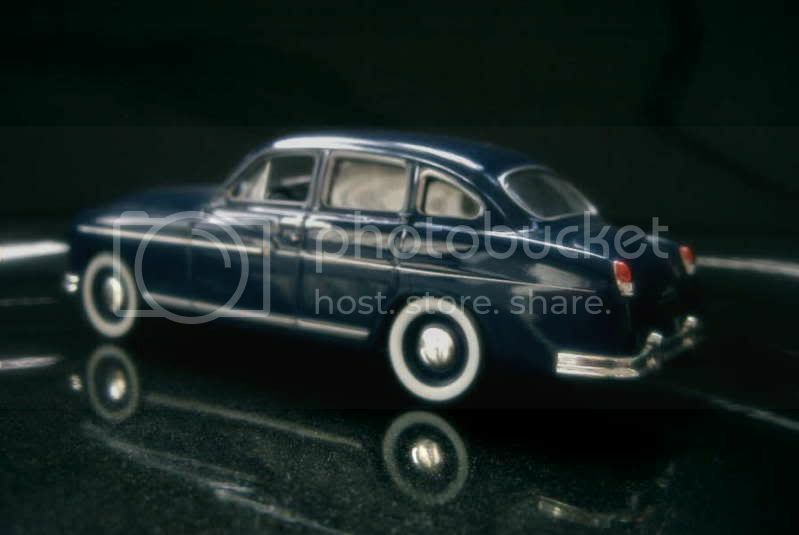 Its ravishing dark blue paint nicely befits the elegance of the car's lines. I'd give it a 15/20.